It was a moving experience as our tour boat cruised near the rocky shoals of Malta this fall. There was a pillar-like monument on the uninhabited headland indicating the likely place where the apostle Paul was shipwrecked on his way to Rome (Acts 27). I read and identified with the story while on duty in the Bering Sea early in life and now, over four decades later I am at this divinely historic spot near the tiny island of Malta. Malta is a tiny island nation between Africa and Italy in the middle of the Mediterranean Sea. 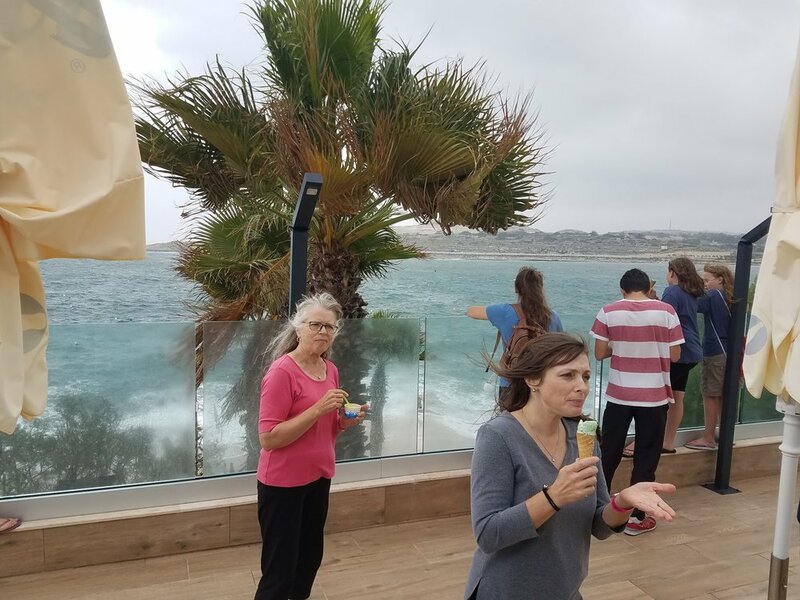 Nancy and Rachel trying to enjoy ice cream while being assaulted by a sudden Mediterranean storm kicking up some waves. It was late fall when the large grain ship the apostle was traveling in was lost at sea for two weeks in a storm. The captain feared the worst but Paul, a prisoner being transported to Rome, announced that an angel told him the ship would be lost but all 276 souls would be saved. Soon the vessel did breakup but all made it to shore on floating debris. They spent the next three winter months here and then found a ship to continue their trip to Rome where Paul would be tried. This beach on St. Paul’s island that Paul’s ship was thought to be wrecked on in Malta (Acts 27). A second possible site has been more recently discovered farther to the south on Malta where an ancient anchor was discovered. What does Malta have to teach us today? We were there at a conference with our missionary kids and were reminded by the speaker that the story instructs us about “time outs” in life. Paul didn’t expect to winter there. But they had no choice. It is good to not panic if our schedule does not go as planned. The side roads and ship wrecks of life are not a surprise to God. This was Paul’s fourth shipwreck (cf. I Cor. 11). He knew the routine. 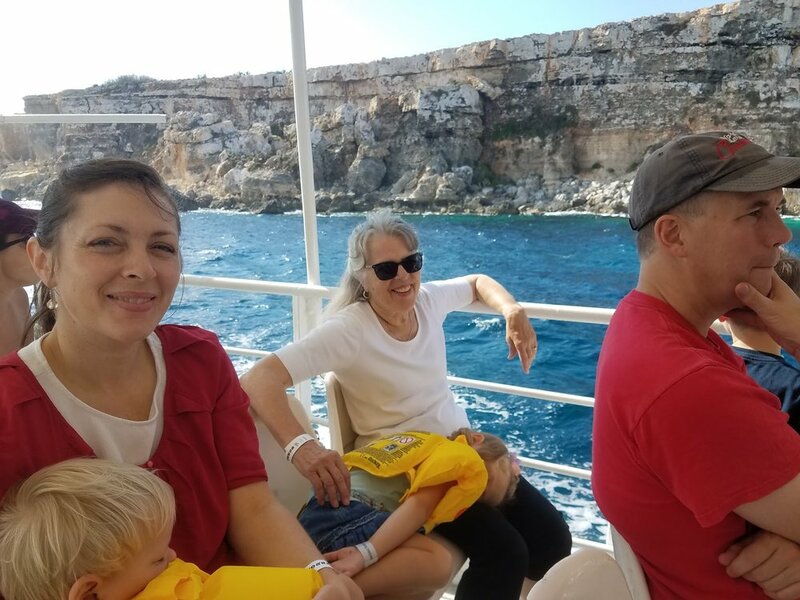 Rachel, Nancy and Michael and a few grandkids touring around Malta. On shore Paul, still a prisoner. quickly helped gather sticks to build a fire for the cold and wet people. His concern for others is a good example to us. Suddenly a viper attached itself to his arm but he shook it into the fire. Local residents were polytheists and immediately thought Paul was a god. He quickly corrected them. Soon Paul was invited to stay with a leading islander named Publius who had a sick father. Paul prayed for the father who was healed. Publius was obviously blessed by this. Tradition says he became the first bishop here and later was bishop in Athens. Likely many on the islanders came to Christ as a result of Paul’s time here because when they finally left the islanders “honored us with many marks of respect” Luke says (28:10). The island is not much larger than Vashon Island but has remnants of over 350 church buildings today. Paul’s also undoubtedly impacted the passengers and sailors who likely carried the message of the Gospel to other distant destinations. I was beached on the rocky shore with my grand-kids Ellie, Jonathan and Daniel. It was a nice “time out.” We watched our step for vipers too. Malta as a “time out” place is one we may find ourselves beached on at times. It may be a sickness that slows us down or a financial problem that causes a break up of our ship of life. Whatever it is we should turn to the Lord to see how He can change us or use us on that lonely isle. Christ said, “I will never leave you.” (Joh 14:18). "Peace I leave with you; My peace I give to you; not as the world gives do I give to you. Do not let your heart be troubled, nor let it be fearful.“ (Joh 14:27). Paul knew this vividly and used his time to pray for and reach others. He practiced the Great Commission (Mat. 28:19-20) even here. Next time you are beached for in traffic, delayed at an airport or on a plane, or stuck at a party you can’t leave from soon, then don’t complain. Instead pray and look for opportunities to help or reach others as Paul did. Right now Discovery is in a “time out” as we await a building permit. This time has allowed us to pack and store things before starting. We are “Building for the generations to come” and we can seeing them coming every rush hour now. Malta profited from Paul’s presence. As an apostle to the Gentiles his ministry in Malta had real impact. It is considered the most Catholic nation in the world. However, the Catholic church today is far different from Paul’s time. Rome no longer teaches the Gospel of free grace alone in Christ alone apart from any human works. Today it is in great need of reform. On the tour boat I met a local massage therapist who had a small practice on the open stern. He told me he was a Catholic but didn’t go to church. I said, “Why?” “Because I don’t trust the priests.” he said. Then I related the story of Paul and what the gospel really was. The young man agreed but didn’t own a Bible. He promised to get one and read it. Ironically his name was Luke, like Paul’s medical assistant Luke on the ship. Pray for this modern day Luke to come to know Christ personally. I had the chance to tell Luke the therapist about Luke the physician who traveled with Paul and also was shipwrecked in Malta. Behind family are the Megalithic Temples of Malta. They are UNESCO World Heritage Sites because they are the oldest free-standing structures in the world built 5,600 years ago. These polytheistic people may have been the ancestors of those Paul encountered. Picture LR: Mishael, Christina, Nancy, Noelle and Caleb Suko. Today Malta is a key destination for Eastern Europeans. The price and weather are right. I heard that travel literature also now says Malta is the top LGBT destination in the world. This is stunning in light of the Catholic presence on the island that once was considered conservative. Revival is needed. Malta is also a refugee host country for those escaping from Africa. Many have died at sea trying to make it there. Last year they hosted 8,000 refugees. God is still working. A good friend of mine has ministered there for years in solid churches. A recent letter from the head of Baptist Mid-Missions, Vernon Rosenau, reports how the gospel has impacted three generations in Malta. Recently “a middle-aged couple, their children, and the wife’s family have all been baptized as a testimony of how Christ has given them new life.” God bless them and the work of the Gospel of free grace on little Malta. Men don’t forget our Men’s Discipleship Christmas Breakfast at the church with Dave Lunsford speaking 8:00 AM 12/15/2018. Ladies don’t forget the Christmas Joyful Jingle Dinner at the chuch 5:30 PM 12/15/2018.